A photo from an activity in Aland Islands, Finland, 2009. The sign translates as "Hi. I'm your new neighbour"
The "Atomic Threats In The Baltic Sea Region" project was inspired by the 2010 "Stop Nuclear Power - Baltic Sea Info Tour". We want to investigate and educate on atomic power in the area, and on the risks it poses to people and environment. We also consider it a great chance to develop and strengthen the network of anti-nuclear activists around the Baltic Sea. Our project can be a basis for mutual campaigns, projects and actions. We hope people will take this chance to take more powerful action against the threatening atomic industry and their lobby. This project combines a variety of patterns to raise awareness on atomic threats in the Baltic Sea region. We are setting up a database with information on all atomic facilities and topics in the region (find a list of considered topics on our website). To develop this information base we are investigating facts and searching for contacts to critics in the whole watershed of the Baltic Sea. The information we provide will be checked by independent experts and anti-nuclear friends to ensure a high quality. The articles in the database are supposed to be kept up to date by committed people within this project. Based on these investigations, we intent to produce a reference book on all atomic facilities in the Baltic Sea region - including those decommissioned already, those being in operation right now, and those only proposed at this point of time. Basically, it will be a means for interested people to find main facts, links to additional resources and contacts to critics. Additionally, we want to publish flyers in several languages to spread the word about the local struggles of anti-nuclear groups in the area. Thus, our project will also strengthen and support the local activities of anti-nuclear activists around the Baltic Sea. The text and images are supposed to be provided by the local groups, we will help to promote and distribute them to anti-nuclear groups and to the public worldwide. The flyers will be added to the series of reach out materials of the Nuclear Heritage Network - we will print a minimum amount of 1,000 copies per topic and in each language version and more if additional funding can be raised. Additionally, all materials will be published online. For connecting concerned and committed anti-nuclear people around the Baltic Sea and to strengthen them, we have set up the "nuclear-baltic" listserve. This mailing list is used to organize this project and to exchange on atomic topics in the area. A proposed poster is supposed to visualize the threats posed by nuclear power in the Baltic Sea region. It will be distributed widely and should be attached to walls in many public places, e.g. cafés, youth clubs, libraries, to raise the awareness on the atomic impact on our lives. The poster will promote the website with background information on all these facilities and contacts to critics in the region. Information events will be organized in several countries and spread the word on the radioactive pollution of the Baltic Sea region, or focus on specific facilities and threats people and environment are faced to. These information events could be organized in the form of an infotour, and they could be accompanied by a photo exhibition on anti-nuclear issues and protests around the Baltic Sea. We will spread the word on our project, topics and specific threats posed by atomic facilities also in articles to be published in anti-nuclear and environmental media (e.g. 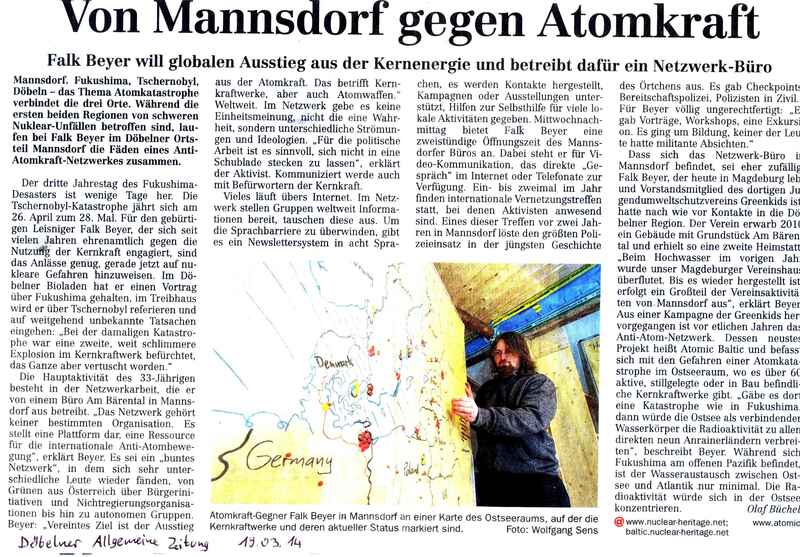 grünes blatt, anti atom aktuell, Nuclear Monitor), make contributions to newsletters (e.g. NukeNews), and do media work for conventional media locally and internationally as well as for independent media platforms such as indymedia. If people are interested and help to organize that, we will also arrange networking gatherings with local people and creative street actions to gain more public attention on atomic threats. We could start new mailing lists for specific issues, produce more information materials and set other ideas into practice to stop nuclear power. Nuclear power is dangerous for people and environment in many ways: it starts with uranium mining and its further treatment, goes on with the risks during the operation of the power plants – as proofed by Chernobyl, Fukushima and Harrisburg (Three Mile Island) – and eventually there is this big problem left over: no safe solution for a final disposal of nuclear waste anywhere on earth. Hundreds of thousands of people died in consequence of the catastrophe in Chernobyl (Soviet Union; these days: Ukraine), the same is expected for Fukushima (Japan); millions of victims are expected to suffer the long-term impacts of the radiation released by these atomic facilities. Serious accidents took place in many other sites every few years, too: Windscale (1957 - United Kingdom), Mayak/Kyshtym (1959 - Soviet Union; these days: Russia), Tokaimura (1999 – Japan) are examples for nuclear accidents killing people directly. Other accidents like Brunsbüttel 2001 in Germany were close to a meltdown. Since decades scientists warn the health impacts of radiation to be under-estimated enormously. The so-called "low" level radiation released by atomic facilities and within transports of radioactive material has the potential to damage cells and genes causing diseases, genetic damages and deaths. During the last ten years a number of studies has showed significant evidence for regularly operated atomic power stations causing cancer. The "strongest" study is still the so-call "KiKK study" including the biggest data collection showing a seriously increased risks for children living close to German nuclear power plants to experience cancer. Within the operation of uranium mines huge amounts of uranium ore are dug and stored on surface releasing radioactive materials like radon and spreading radioactivity to the surrounding water systems and environment in general. Uranium mining exposes the these days mostly indigenous workers to serious health risks. Thousands of cases have been officially registered already. Besides this dangerous release of radiation, the uranium mines produce huge amounts of "tailings" - radioactive and toxic waste waters stored forever in so-called tailing ponds mostly unprotected in nature. The fuel used in atomic reactors includes a major share of the uranium-238 isotope with a half-life of some 4.5 billion years. It takes some 45 billion years before most of the isotope will be decayed. During the decay, other isotopes and elements are created with different amounts and types of radiation releasing as well with different half-life. As any amount of radiation is capable of causing health impacts, radiation exposure is to be reduced and avoided as much as possible. Thus, a safe final disposal of the radioactive waste is necessary for millions and billions of years. In the light of significant and unpredictable changes in society, knowledge of people and nature, such a safe disposal is impossible. Some of us were involved to the "Stop Nuclear Power - Baltic Sea Info Tour 2010", and got to know about the specific situation of this sea. Due to the low water exchange with the Atlantic Ocean, the majority of radioactive particles once captured in the Baltic Sea accumulates there. Thus, the fallout of nuclear weapon tests, Chernobyl accident, and Sellafield emissions concentrated in it and made it - according to the data of the scientists of the countries of the Baltic Sea region gathered in the "Helsinki Commission" (HELCOM) - the most radioactive inland water body in the world. Data also shows the radioactive impact of nuclear facilities of former Eastern European countries and Northern ones. Following this information it seems that even the biggest radioactive pollution is released by the Studsvik atomic facility in Sweden. Getting in touch with activists in the Baltic Sea countries, learning about the facilities in their regions and understanding that the public is hardly informed at all about the specific pollution of the sea and the threats it is additionally faced to by the proposed uranium mining projects and by transports of atomic fuel and nuclear waste, we got inspired and motivated to focus on this topic more. Some of us connected with each other, experts and further organizations in this region to get prepared to start this project. We understood that there is a basic lack of information within the anti-nuclear scene as well as in the general public. When we started to create an overview for ourselves, we figured out that there are more than 60 atomic facilities in the water shed of the Baltic Sea - partly in operation, some are already decommissioned (but potentially polluted the sea in the past and still pose the risk of having left contaminated ground), and a number of them is still in the stage of being planned or constructed. Our project aims on educating people and public in general on the radioactive pollution of the Baltic Sea, particularly by informing about the specific atomic facilities and their threats. We also want to support dedicated activists educating and campaigning against certain plants in their region by connecting them with each other and by providing the contact to them with our publication work. Thus, we want to strengthen the networks of citizens, and to support - particularly, but not only, young - people to understand their civic rights, to teach them as well methods of implementation of those and of reaching other citizens (or to put pressure on decision makers in institutions and companies) as knowledge on atomic power. We also want to learn ourselves more about nuclear power, the policies in European Union and in the states around the Baltic Sea, get to know experts and activists in the nuclear field and develop our skills regarding public relations, media and investigative journalism. Thus, we want to investigate facts and background information on each atomic facility in the Baltic Sea region as well as activities of organizations criticizing them. This information will be preprocessed for raising the public awareness on the risks of nuclear power, and will be provided in raw and unmodified form on our website, too. Tools for putting our goals into effect will be this website acting as a database on all atomic facilities, flyers we will produce, a reference book and a series of information events. As atomic policies in Europe are much influenced by transnational treaties and co-operations, it is also important to understand these mechanisms, and to show other people the importance to act together on a transnational level, too. We want to show how the civic rights provide tools to make a change in the European, but also national and international, energy policies. People need to become aware of the international dimension of nuclear power, and the interconnections of impacts of this technology in the Baltic Sea region as well as the international treaties in effect in this area are a good example for this interdependency. The aim of this section is to gather projects and campaigns of anti-nuclear struggles around the Baltic Sea. This network/project intends to connect these struggles and people with each other, we want to support activities and motivate others to join ongoing activities or to encourage to start their own initiatives. Please note that not all of the mentioned projects and events are projects of the ATOMIC THREATS IN THE BALTIC SEA REGION network/project! In this section we organize and coordinate the work on this project. It will maybe later be transfered to an extra page, when it should become too big for the main page of project. The first big planning meeting (programme) for the project took place on September 20-23, 2013 (including arrival/departure day). Venue was the project house in Döbeln (Germany). This was a good chance and important to start well with the project. Travel costs could be covered, if they were confirmed beforehand with us. To prepare this event we had a Skype conference on September 4th at 8 PM CET, a Skype conference on September 12th at 8 PM CET and a last Skype conference on 18th of September 2013 at 8 PM CET. As a contact possibility, for coordination and clarification of urgent issues, we continuously have Skype conferences (or any other voice-over-ip conferences) to keep the process in a flow and to exchange on what has been done in the time between. It will also be easier to share tasks and be motivated for your own activities when hearing what others were doing. Interested people and new activists with the Atomic Baltic network/project are always welcome to utilize this audio conference to come in touch with us and to get updated. Also everyone else, who just wants to take that chance of receiving an easy update of activities and happenings of the network is invited! It is an open platform for everyone interested, you can bring up your topics and requests, and you can also volunteer to get involved. The last Skype conference took place on December 27, 2014 at 8 PM CET. Please send us your Skype names to get in touch with you for the conferences! This is an overview of important tasks, roles and responsibilities for the project. social media (e.g. Facebook), email promotion, flyer/poster/...? translations: German, ... + ? We want to involve as many interested and committed people and groups to this project as possible. Thus, we have to spread the word also about the "Atomic Threats In The Baltic Sea Region" project. A first call out invites individuals and organizations to the planning meeting and to join the project. Continuously we should consider who else to invite and to inform the interested public about the network/project and to motivate them to take part. There had been a new Call Out later on, and now, for the 4th working meeting, we created a third Call Out. Though the project is very much an investigative and educational one, it is a great chance to spread the word on atomic risks and threats. Would be good to do media work to reach a wider audience with what we do. A first press release about the project to be started should be sent out in August to media. Who wants to join the media group? And who can help with translations of media releases in other languages? - Please write us! The grant we received provides a financial budget to get started. However, it can't cover everything - e.g. the later working meetings' travel costs are only covered by 70%. If you think we should be able to cover everything, we need to apply for more funding (or raise additional money otherwise). Volunteers for that task, please connect to us! We calculated we would need at least 12 committed people to continuously investigate on all facilities in the region. So far, we found already more than 60 plants - and there could be more! We want to use five of our project meetings spread over the period between autumns 2013 and 2014 as deadlines to finish one topic per person and to publish a preliminary article on our website. Thus, we would have 60 articles in the end. However, as there are more articles, we also look for people who only want to commit to investigating on just one or a few facilties. Please contact us if you can help! Here is the list of facilities and articles. Bold marked topics already have someone to investigate and write the article about. If articles or drafts of articles already exist online, the topics are linked to them. You are welcome to proofread them, and please use the "discussion" page of the article to leaf your comments and a contact information (like email address, phone number...). Some of these requirements don't fit to certain types of plants - then you have to replace them by other reasonable basic information. Our group has been formed to promote this project on atomic threats around the Baltic Sea. We want to investigate and educate on the risks of nuclear power, connect to anti-nuclear groups in the region, and to raise the public awareness on the impacts of this technology on human beings and environment. As an informal group we can use the infrastructure of the project house in Mannsdorf, a part of the city of Döbeln. We are in touch with activists from other countries, particularly in the Baltic Sea region. Our group will take part in the investigations, and help to coordinate the project. We will take over responsibility for the bookkeeping of the project and for this application. We will take over the practical local preparation work for project gatherings, and we will care about the shipment of information material produced within the project. More organizations and groups are cooperating with us to support the intention of the "Atomic Threats In The Baltic Sea Region" project. We are very interested to gain more partners to put our ideas into practise, and to strengthen the networks of anti-nuclear activists in the area. This page was last modified on 3 April 2019, at 06:53. This page has been accessed 205,462 times.